This is a collection of fifteen scholarly articles discussing the two great sages Rashi (1040-1105) and Maimonides (1138-1204) who lived almost exactly a century apart and who had radically different views about virtually everything related to Judaism. Rashi’s ideas are taught to young school children and in higher grades, and are the substance of the sermons of many pulpit rabbis and the basis of the thinking of most Jews about their religion. The teachings of the great eagle, as the rationalist philosopher Maimonides is called, is known only to a few intellectuals, and frequently misunderstood. Hence, this volume that discusses his views and contrasts them with those of Rashi is a welcome addition to our knowledge, and it stimulates readers to think more deeply about Judaism in particular and religion generally. Menachem Kellner, for example, contrasts the world views of the two sages in his article. In his first commentary to the Torah, Rashi offers his particularistic Jew-focused view that the Torah begins by saying that God created the world to declare that it belongs to Him, He wants the land of Israel to be given to the Jews, and He created the world so that the Torah could be handed to Jews. Maimonides does not claim to know why the world was created. He would consider Rashi’s idea, to use Kellner’s words: “misconceived; it is both a philosophical mistake, and I am confident he would have said, an act of unparalleled hutzpah.” Yet, although Maimonides had no knowledge why God created the world, he felt that it is reasonable that God revealed laws to improve the behavior of individuals and societies and to raise individuals to the highest perfection they can attain. Maimonides taught that this perfection can only be achieved if individuals learn how God functions in this world. This requires that people study philosophy. But they cannot study philosophy unless they have already studied and understood the sciences, including physics. Thus, concludes Maimonides, the Torah does not begin by speaking about creation to tell us, as Rashi contends, that God owns all that is created and He gave Israel to the Jews. Instead, the Torah opens with a discussion about science since this is the basic knowledge that people must learn. However, since many people are unable to grasp the principles of science, the Torah teaches science in mythic, parabolic language. Thus, besides the already stated differences, Rashi takes the creation story literally, while Maimonides sees it as a parable. 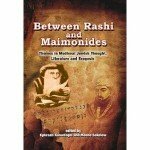 Both Rashi and Maimonides recognize that the Torah is a book of laws. However, “they disagree mightily on the nature of those laws and the reasons for which they were commanded.” Rashi is particularistic: the Torah is for Jews. Maimonides is universalistic: the Torah has messages for all people. Rashi, as some other sages, was convinced that the patriarchs, the Jewish ancestors Abraham, Isaac, and Jacob – and even other righteous people, such as Noah – observed all of the 613 commands contained in the Torah, even though the Torah was not revealed until centuries after their death. Rashi was persuaded that the Torah existed before the world was created. Maimonides rejected the notions that the Torah pre-exited creation and righteous people observed all of its laws before it was revealed to Moses. These ideas made no sense to him. God did not choose Abraham, God did not seek him out, God did not make Himself known to Abraham. God waited till someone discovered the truth about Him; that someone happened to be Abraham, progenitor of the Jews. It did not have to be Abraham. Had the first human being to discover the truth about God been, say, a Navajo, and had that Navajo philosopher the courage and effectiveness of Abraham, then the Navajos would be the chosen people, the Torah would have been composed in the Navajo language, its narratives would reflect their history, and many of its commandments would reflect that history and the nature of Navajo society at the time of the giving of the Torah to them. Thus, Menachem Kellner shows that while Rashi sees the world and God in an almost mystical, certainly in a non-philosophical Jew-oriented sense, Maimonides is philosophically sensitive, focuses on the world, Torah, and Judaism naturalistically. Eric Lawee describes about a dozen frequently quite vitriolic critiques of Rashi’s overuse of Midrashim. Nachmanides was repeatedly critical of Rashi in his commentary to the Bible. In one instance, for example, he wrote that Rashi’s analysis is psychologically implausible. Others called Rashi’s interpretations barbaric, full of hot air, the work of a dolt, a figment of an overwrought female imagination, and the writings of one who does not know the true meaning of the Torah or of the Midrashim he is quoting. These are some of the fifteen interesting articles that appear in this thought-provoking volume.